This past weekend Crappie USA held a two-day $10,000 Super Event on one of the most popular tournament sites in the nation: the Pickwick/Wilson Lakes at Sheffield, Alabama. Over 100 anglers from 13 states were competing for not only the $10,000 in cash and prizes, but the opportunity to qualify for the prestigious Cabela's Crappie USA Classic. This year's classic will be held October 24th-27th, 2012 on the Barkley/Kentucky Lakes at Cadiz, Kentucky. 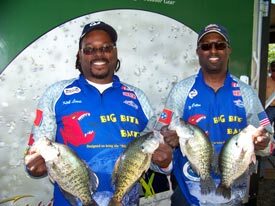 Taking first place and $3,000 was the Memphis, Tennessee team of Warren Cotton and Kirk Lewis with a two-day total weight of 23.99 pounds. Cotton and Lewis were slow trolling orange/chartreuse Big Bite Baits in 11 feet of water over manmade structure up Bear Creek to catch around 35 fish each day. Second place and $1,500 went to Brian Arnett and Marc Shoulta of Kentucky with a two-day weight of 22.17 pounds. The duo also earned an additional $250 for being the top placing team by weight using Stubby Steve's Baits and also an additional $250 for the Semi-Pro Ranger Cup Award. Arnett and Shoulta were spider rigging orange/chartreuse tube jigs tipped with Stubby Steve's Bait in 11 feet of water up Bear Creek. The team caught over 80 fish in the event. In third place was Steve Coleman of Tiptonville, Tennessee with a weight of 20.68 pounds, earning $1,000. Coleman was fishing for suspended fish in the main lake channel in 30 feet of water one mile south of the Pickwick Dam then moved to Bear Creek in 12 feet of water using large minnows on B'n'M Poles to catch 50 fish. The Murray, Kentucky team of Doyle and Sonny Milby finished first in the Amateur Division with a two-day total weight of 18.51 pounds, earning $1,500 for their victory. The Milbys also received $200 for the Driftmaster Rod Holder Bonus. The team slow trolled lime/chartreuse Southern Pro tube jigs tipped with Stubby Steve's Bait in 9 feet of water over natural wood cover up Bear Creek, catching 75 fish for the event. Second place went to Keith Griffin and Brent Smith of Tennessee with a weight of 18.41 pounds, earning $1,000. Griffin and Smith also received an additional $95 for second biggest fish of the event with a 2.03-pound crappie. The team spider rigged black/chartreuse Southern Pro Lures over brushpiles in 15-20 feet of water in Bear Creek to catch 35 fish both days of the event. Taking third place and $600 was Roger Milby of Auburn, Alabama with a weight of 16.07 pounds. Milby was pushing jigs in 9-12 feet of water up Bear Creek using black/chartreuse Southern Pro jigs to catch 120 keepers in two days. Taking big fish of the event was the Dexter, Missouri team of Dan Hudgens and Bruce Christian with a 2.05-pound crappie, earning them $200. Hudgens and Christian caught the big crappie in five feet of water up Bear Creek using glitter-colored Southern Pro jigs.